AEG Plancha Grill is rated 5.0 out of 5 by 8. The AEG Plancha Grill is a custom made kitchen accessory that combines beauty and functionality, allowing perfect heat distribution on OptiZone induction hobs. Whether you are grilling wagu or barbecuing prawns, the AEG Plancha gives you the control to create perfect meals when entertaining friends or preparing a dinner for two, thanks to the half grill, half barbecuing design of the cooking plate. 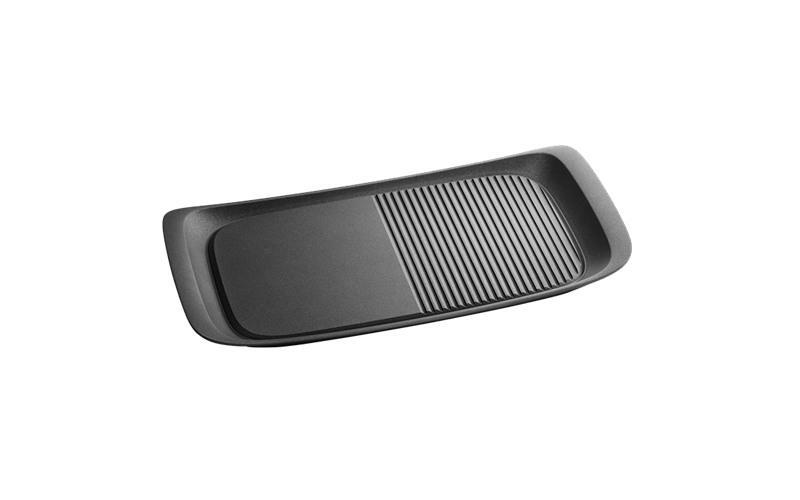 Rapid and even heat distribution across the entire cooking surface on induction cooktops is achieved with the aluminium composite cast design of the Plancha. Being made from an induction ready aluminium composite means the Plancha is light-weight and easy to handle, providing a perfect cooktop barbequing experience. Experiment with a variety of cuisines and healthier food options with the triple layered non-stick coating used on the AEG Plancha. The triple layer ensures food does not stick to the cooking surface and makes for an easy clean-up. Unlike lower quality non-stick products, with the AEG Plancha you will only need to use oils for flavouring your food. Rated 5 out of 5 by JonnC from Excellent addition to my Kitchen I purchased the Grill for the Electrolux induction cook top with my new stove and found it to be excellent, realising and going beyond my highest expectations as a professional Chef. The conductivity is good and even, It is easy to clean and store. when you use the Grill, the need for fry pans or a BBQ is reduced or made redundant for grilling purposes. N.B. You can not use on P (full power) and needs to be one setting down or less or will flash and stop. You can however have two different heat settings as the Grill covers two induction hobs. Without doubt some $250 appears pricey when you buy however the value is there and actually excellent value.. Rated 5 out of 5 by very happy from perfect for cooking on the AEG induction The hot plate we purchased was perfect for Xmas and new years day for doing BBQ and prawn, beef ,pork, vegetable and chicken skewers. Made a huge difference in the cooking experience and very happy with the purchase. Rated 5 out of 5 by Nikki72 from Great cooking accessary I love the fact, that you are cooking on an induction cooktop in your kitchen, and then add the griddle pan, and it feels like you are cooking on your BBQ, without walking outside to fire up another appliance. Rated 5 out of 5 by Shoey from how good is this product. The meat cooks perfectly and looks like a chef has cooked it So easy to use and the results are great. When cooking meat it always comes out looking great and tasting so amazing. Rated 5 out of 5 by Sue2428 from Great product I purchased the grill plate on a recommendation of the salesperson at Harvey Norman and am so happy that I bought it. I use it all the time for grilling steak, kebabs, salmon and get great results every time. Would have no hesitation in recommending it to everyone.